NCHART is a highly specialized team consisting of N.C. National Guard and N.C. State Highway Patrol aircraft and aircrews matched with N.C. Emergency Management and local first responders that form a mission ready package for helicopter based rescues. NCHART can respond at the request of a local emergency management coordinator or NCEM Area Coordinator upon approval by the NCEM Director. NC HART trains on a monthly basis in various skills ranging from swift water/flood rescue to high angle and wilderness rescue. NCHART can respond at the request of a local emergency management coordinator or NCEM Area Coordinator upon approval by the NCEM Director and State Air Boss. Providing as much information as possible on the NCHART Mission Request Form (Hyperlink to form) will better prepare the enroute resource to effect a safe and efficient rescue. At a minimum the Requesting Agency must provide an incident location and contact information for the Incident Commander or Air Operations Branch Manager. Each of the three distinct platforms in NC HART trains monthly to maintain qualification in four levels of mission complexity. All NC HART training is performed as a progression where skills are built from the ground up going from the most basic Level 4 training to the most complex Level 1. Each crewmember is required to remain current in each mission area to be qualified to work that specific mission type. Level 4 training is the most basic of the four levels and includes day/night operations in open land based environments. These areas have limited confinement and represent the most basic hoist or short haul operation. Level 3 training is the most basic of water operations and includes day / night operation in open static water environments. These areas have limited confinement in a static water area and represent the most basic water operations for hoist or short haul operation. Level 2 training is confined land based rescues where extremely precise operations are required to perform the rescue. Examples of Level 2 training are day/night cliff rescues, buildings, windows, and tree based rescue. Level 1 training represents the most complex helicopter based rescues in a day/night operation. These rescues involve moving water operations where the entire rescue is performed in a dynamic environment that may or may not be also in a confined area. These rescues require extreme precision and coordination between all crew members to safely execute the mission. NC HART also provides training from ground based support members through the NC HART Operational Support Specialist Class. This training is targeted to local response personnel and provides a basic understanding of the program capabilities, limitations, and requirements to perform a helicopter based rescue. The curriculum includes important information including safety considerations, contingency planning, and operational requirements of NC HART. Unfortunately, we are not currently accepting new candidate applications at this time. 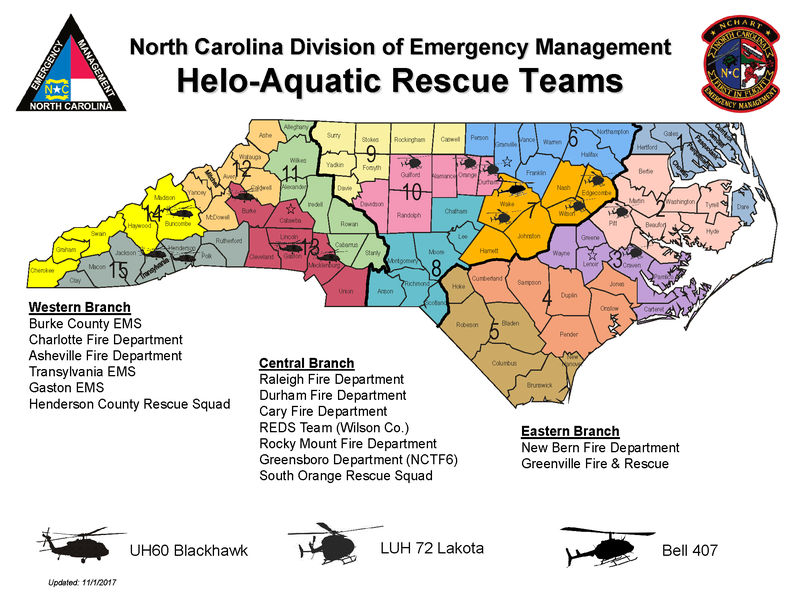 The process of joining NC HART starts with a potential candidate first being a member of a local response organization that is already on the state deployable list in one of the five state search and rescue programs. Then once there is an opening on NC HART notification is sent to all current team/taskforce leaders providing details and a timeline on the process. Phase 1 of selection for NC HART starts with the NC HART CPAT. This evaluation scores potential candidates against their peers. At this time candidates also submit relative certifications as well as recommendations from their chief or team/taskforce leader. Phase 2 of selection starts with a 50 hour basic HART indoctrination course. This course teaches the candidates all of the foundational skills of being an NC HART Technician. This includes completion of the NC HART Taskbook for Helicopter Search & Rescue Technicians. Upon successful completion of this course the candidate is considered an NC HART Technician in a non-deployable status. After Phase 2, the new technicians are assigned to one of the three platforms and begin to attend the monthly trainings. Once the technicians become proficient in the four training areas then they are released to full status. This can take up to a year and is solely based on skill progressions of the new technician.